Original Oatmeal Scone Mix is our second ‘base’ scone mix. Our oatmeal scones bake up with a crunchy exterior and a fragrant and tender interior, textured with oats. Oatmeal scones are delicious ‘plain’, but the mix is a perfect base for a large variety of flavor additions. When I make Oatmeal Scones, I lean to the fall flavors and spices. Dried dates, apples, raisins, cranberries, nuts, and fall spices are a good flavor balance for the oatmeal base. Substitute some pure maple syrup or concentrated apple cider for some of the buttermilk, and change the background flavor. 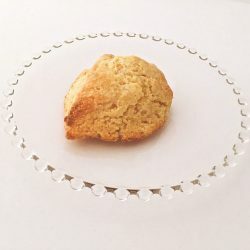 Specific oatmeal scone variations are linked on our Recipes page. Our Original Oatmeal Scone Mix has a combination of both white and dark brown sugar in the mix. When you make the dough you will be adding both butter and buttermilk. Because of the oats and the dark brown sugar, the dough may be softer than our other scone doughs. 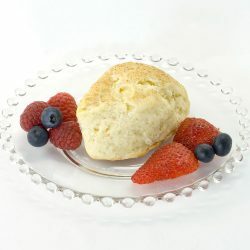 The dough freezes well, so you can make up your dough in advance, and freeze as individual, ready-to-bake scones. Full freezing instructions can be found here. Unbleached wheat flour (wheat flour, niacin, iron, thiamin mononitrate, riboflavin, folic acid, enzyme), rolled oats, dark brown sugar, granulated sugar, baking powder (sodium acid pyrophosphate, sodium bicarbonate, corn starch, monocalcium phosphate), baking soda(sodium bicarbonate), salt.